Oscilloscope Diagnostics & PicoScope is a one day training course for oscilloscope users. The course focuses on use of the well known PicoScope automotive oscilloscope diagnostics kit, featuring a wide range of PicoScope accessories. During the course you will learn how to use the oscilloscope diagnostics menus and settings, and identify what to look for when testing electrical systems and components. The course takes a hands-on approach to oscilloscope diagnostics as an aid to fault finding on modern vehicle electronic systems. You will learn how to use the oscilloscope to test the multitude of sensors and actuators used in petrol and diesel engine management systems. This includes testing of spark ignition systems and petrol and diesel common rail injector control circuits. You will also learn how to test the CAN Bus and use oscilloscope diagnostics to perform a wide range of other useful checks. The course is mainly workshop based using the oscilloscope to perform diagnostics on live vehicles. This is further supported by presentations, demonstrations and case studies of real time vehicle faults diagnosed using the PicoScope. 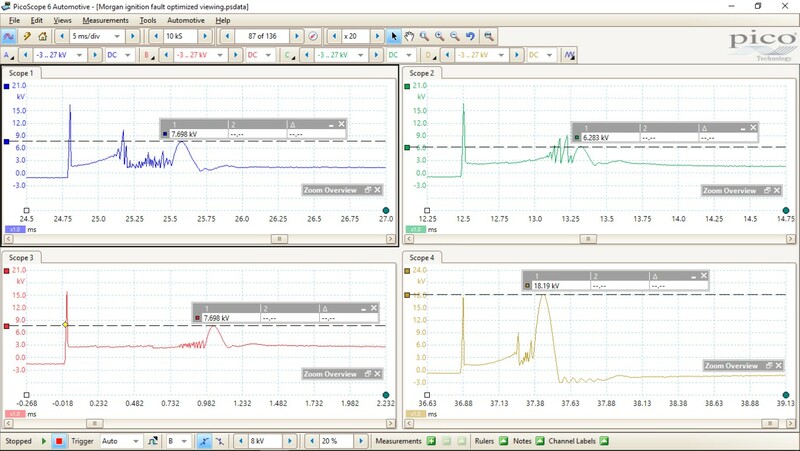 At the start of the course you will receive a detailed, fully illustrated set of course reference notes with example oscilloscope waveforms, settings and other useful tips on how to use PicoScope. By the end of the course, you will be able to use the PicoScope automotive oscilloscope diagnostic kit more effectively when carrying out oscilloscope test routines on your customers’ vehicles. At the end of the course you will receive a Certificate of Professional Development from AK Automotive in recognition of your attendance on the Oscilloscope Diagnostics & PicoScope training course.